The price of SanDisk's 128GB Ultra microSD card has been on a steady downward trend over much of the last year, picking up pace over the autumn months. 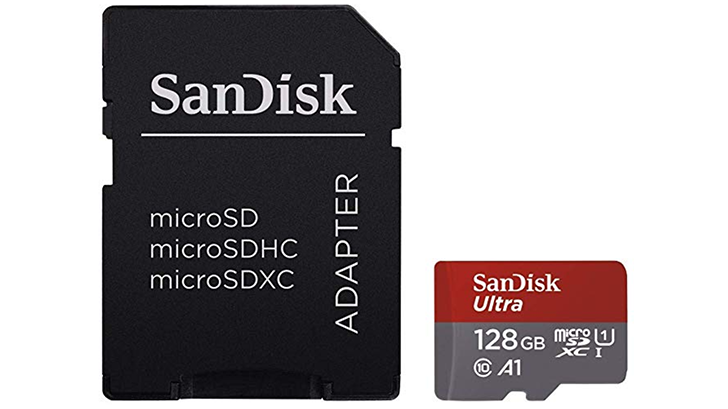 In early November last year, the 128GB card cost $44 on Amazon, now it costs a mere $22 — the lowest Amazon listing price yet (though third party sellers have gone lower). That's even more impressive considering SanDisk first sold the memory card for $199.99 back in 2014. The card's Class 10 and U1 rating means it has a minimum sequential writing speed of 10MB/s, which isn't the fastest you can get (U3 cards have 30MB/s minimum speeds), but it is a fair value for the price. The card comes with an adapter that allows it to fit slots made for microSD, microSDHC, and microSDXC. It's listed as 29 percent off regular price of $30.90 (though looking at the downward pricing trend, that might not be set in stone for long). Find the deal at the source link below. Readers point out that, as we'd previously posted. Samsung's 128GB U3 microSD card is available for only a few dollars more — $24.99 — through Amazon. Thanks for the tip!